Marysville assistant freshman football coach Jim Hodakievic watches the varsity play against Jonathan Alder. Hodakievic, who has been with MHS since 2012, has a lengthy coaching career. If anyone thumbed through Jim Hodakievic’s resume, they’d find that he has a great deal of experience as a football coach. From being a head coach at three different high schools, to working as an assistant coach at two others and to currently serving as a freshman coach at Marysville High School, Hodakievic has more than 40 years experience at teaching high school-age boys the fundamentals of the sport. Hodakievic, who has been with the Monarch gridiron program since 2012, recently sat down for an interview with the Journal-Tribune. Despite the success he has experienced on the gridiron, he wanted to make sure that others receive a lot of credit. “I’ve been blessed with a lot of great kids at all the places I’ve been,” said Hodakievic, 71. “I’ve been fortunate to coach six guys who went on to play in the NFL and others who played college football. Hodakievic, like a number other coaches, keeps in touch with many of his former players. “I couldn’t believe it,” he said. “A couple of years ago, I was shoping at Meijers here in town. I heard someone say ‘Hey coach,’ and I looked around and saw a guy I coached years ago at Defiance High School. Hodakievic, a native of Cleveland, played football at Benedictine High School. Hodakievic played collegiately at Bowling Green State University as a tight end under Don Nehlen, who later went on to coach at West Virginia University. He started as a tight end his junior and senior seasons and was named the team’s outstanding offensive lineman both years. Hodakievic had a chance to go to the NFL after his playing days were over at BGSU. “I had an opportunity with the Green Bay Packers as a free agent when Dan Devine was the head coach,” he said. “I wanted to go, but we (he and wife Joni) had just started a family. He decided to go into teaching and coaching on the high school level. “Something just told me not to go with the Packers,” he said. Something that happened about a year later made him realize he made the right decision. “I came down with a serious kidney illness,” he said. “The doctors weren’t sure if I was going to make it. Once his health improved, Hodakievic continued with his classroom (health and physical education and OWA coordinator) and coaching duties in both football and track and field. Along with being the head football coach at Millersburg West Holmes, Defiance and Bedford high schools, he also served at one time or another as the man in charge of the track programs at West Holmes and Warren Western Reserve high schools. 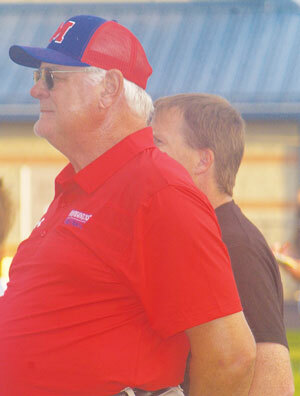 His football head coaching career began at West Holmes back in 1972. From there, he moved on to Defiance and then to Bedford. During that time, he developed teams into state playoff qualifiers. “He served as the athletic director at Akron Hoban High School for two years before he and his wife decided to relocate to central Ohio. Hodakievic’s daughter, Bethany Bentz, teaches in the Marysville School district and is the head volleyball coach at MHS. His son-in-law, Robert Bentz, is a teacher and the track and field coach at Bunsold Middle School. Hodakievic served as a substitute teacher at Mechanicsburg High School from 2007 to 2010 and was offensive coordinator for the varsity football team. He has also been a substitute teacher at Fairbanks since 2009. In addition, he serves as an assistant track and field coach at FHS, specifically working with shot putters and discus throwers. Hodakievic has been with the Monarch freshman football team for the past several years under head coaches Morgan Cotter and Brent Johnson. “Morgan actually asked me to join his coaching staff when he was still at Fairbanks,” said Hodakievic. The Marysville resident has won a number of coaching awards throughout his lengthy career. Every program he took over as head coach improved during his tenure, but he feels people are more important than hardware. Hodakievic continues to coach at an age when many others would just sit back, put up their feet and reflect on a long, successful career. Don’t, however, look for him to do that anytime soon. “It’s about the people, not the trophies,” he said. “I just enjoy working with kids. “It’s especially nice to see how kids I coached on the freshman team develop as they move up in the football program,” said Hodakievic. “It’s also nice to see a kid who throws the shot put or discus improve and develop until they become a regional qualifier. “I get a lot of enjoyment and satisfaction seeing what high school athletes can achieve.